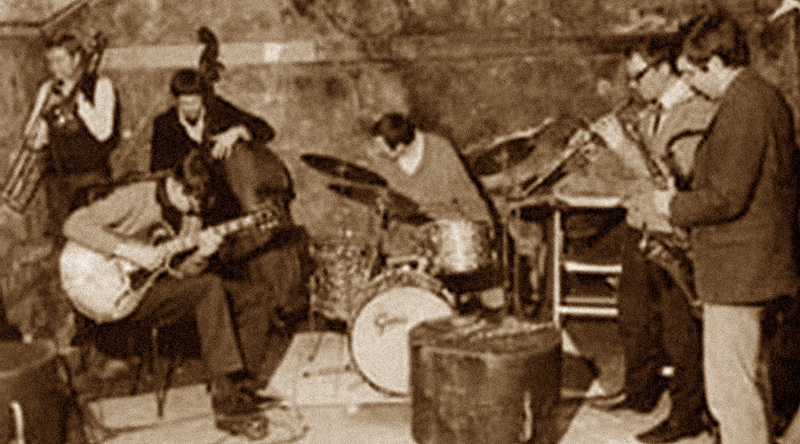 The “Second British Invasion” that came from across the pond may not have been as famous as the first, but when Ornette Coleman made The Shape of Jazz to Come (Atlantic, 1959) and Free Jazz (Atlantic, 1961), musicians such as Paul Rutherford, Trevor Watts and Evan Parker, among others responded in kind. They gave as good as they received, often more original and more melodious—perhaps even harmolodic—than the American cousins. This fact is often ignored and the music of the then, so-called Avant-garde—free improvisers is an infinitely better term—were almost regarded by listeners as lesser mortals. Happily, however, the musical evidence in concerts and on record tells a vastly different story. Challenge, issued in 1966, as Eyemark (EMPL) is one of those spectacular recordings from the roaring freedom of late-60’s Britain. While it may not have acquired the seminal status in the realm of free improvisation then, it is time to accord its effervescent music something of that eminence today by virtue of the good offices of EMANEM, a label that ought to me historically enshrined in the equivalent of the Library of Congress in Britain. 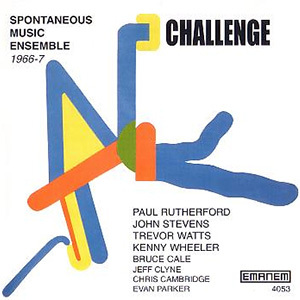 Mr. Rutherford and Mr. Watts are joined by the fully formed Canadian flugelhorn player, Kenny Wheeler and these musicians form a veritable holy trinity within the Spontaneous Music Ensemble. But there is more. John Stevens, as mighty as Ed Blackwell or Andrew Cyrille, keeps the pulse of the music going with ecstatic polyrhythms—rattle and hum of snares and tom-toms, with the occasional depth bomb on the big bass drum are accompanied by the constant chatter on a myriad of cymbals—while bassist Chris Cambridge shares the bass honours with Bruce Cale and Jeff Clyne. But is the soulful triumvirate of Mr. Rutherford, Mr. Watts and Mr. Wheeler who paint the proverbial masterpiece. Their playing is wonderfully lyrical and poignant. Paul Rutherford plays as if his life depended on it. He wails and yowls and adds smears and screams and other primordial voicings (especially vocal on “End To A Beginning”) while Mr. Wheeler evokes misty morning dervishes turning cartwheels around the spiralling double helix dance of Trevor Watts, who proceeds to laugh and cry as he puts his alto saxophone through the paces as never before. “E.D’s Message” might hover in and around the familiar changes of Ornette, but “2.B. Ornette” evokes the sardonic twists and turns of the straight horn by the great Steve Lacy’s yammering vamps as he deconstructed everything from the blues to swing as well as the outrageous rhythmic elasticity of bebop. As the record progresses the music becomes more adventurous with each of the players pushing the other in to dimensions that only the brave or the foolish might venture. The results are stunning, to say the least. “Little Red Head” is breathtakingly beautiful. “After Listening” proffers a warmth and lyricism that weaves and bobs from the flugelhorn to the saxophone and then onto the trombone. The unison passages feature the players at their choral best, sounding as if they were “singing” in glorious and rococo counterpoint. All of this makes the re-issue of this extraordinary record a cause for considerable celebration. Perhaps the cousins across the pond will now succumb to the Second British Invasion after all. Track List: E.D.’s Message; 2.B. Ornette; Club 66; Day Of Reckoning; End To A Beginning; Travelling Together; Little Red Head; After Listening; End To A Beginning; Distant Little Soul. Personnel: Kenny Wheeler: flugelhorn (1 – 3, 6 – 9); Paul Rutherford: trombone (1 – 9); Trevor Watts: alto saxophone (1 – 8, 10), soprano saxophone (9), piccolo saxophone (10); Bruce Cale: double bass (2 – 8); Jeff Clyne: double bass (1, 9); John Stevens: drum set (1 – 6, 8, 9, 10); Evan Parker: soprano saxophone (9); Chris Cambridge: double bass.